If factory farming today were to be seen as a movie-experience metaphor, it would be closer to the screams incited by "Soylent Green" than the groans produced by "Funny Farm." And we suspect that a close review of the production values would yield two thumbs down—way, way down. In the last Eco-Logical, we saw how industrial farming has meant the rise of big agribusiness corporations and the decline of small farms. We know that most blockbusters come in trilogies, but we think the issue of how our food is produced is so important that we ended up coming out of the cutting room with a four-parter. Now, here's more about the cost of industrial agriculture to farmers, farm workers, and the rest of us. This is part 3 of our special series by Skip Spitzer of Pesticide Action Network North America. The articles have been excerpted, with permission, from PANNA's Global Pesticide Campaigner, volume 13, number 2. 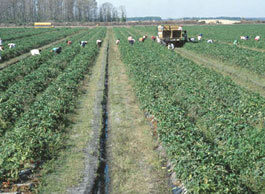 The chemicals and heavy machinery of industrial agriculture create a high-risk work environment. In 1996, the occupational death rate for US agricultural workers was estimated at 20.9 per 100,000 compared to an average of 3.9 per 100,000 for all other US industries. The decline of farming communities has also taken its toll: From just 1980 to 1997, the difference in suicide rates between men in the most rural and most urban US counties grew from 21% to 54%. Nearly three-quarters of US farmworkers earn less than $10,000 per year and three out of five farmworker families have incomes below the poverty level. In developing countries the situation is even more extreme. For example, an agricultural wage worker in Central African Republic needs to work six hours to buy a single kilo of the cheapest staple cereal grain. Industrial-agricultural interests frequently cause displacement of indigenous peoples from agriculturally productive land. For instance, in Chiapas, Mexico, indigenous communities have been pushed to agriculturally poor highland and rainforest lands, and the more productive lands are now in the hands of cotton, sugarcane, and cattle-ranching interests committed to exports rather than production for Mexican consumers. For all of us—the people who eat the food that comes out of the industrial farming system—the news isn't that great, either. Industrial foods are often highly processed, nutritionally degraded, made with hazardous additives, and contaminated with pesticide residues and other industrial compounds. In the US, 73% of conventionally grown foods contain residues from at least one pesticide. Industry-made trans fats, which are present in 40% of processed foods, are so harmful that the National Academy of Sciences' Institute of Medicine suggests that people should simply not eat them. Agrochemicals also pose health hazards in agricultural fields, in neighboring communities, and wherever they move by air and water. The World Health Organization estimates that one million serious, unintentional pesticide poisonings take place globally every year, with millions of additional milder cases likely. Many pesticides also have long-term health impacts, including many types of cancers, neurological effects, reproductive and developmental illnesses, and endocrine disruption. In the US, the Centers for Disease Control recently looked for and found 116 pesticides and other chemicals in human blood and urine, an industrial chemical "body burden" that is passed on to children through breast milk and prenatal exposure. Well, we knew Cheetos weren't health food, but WOW!—industrial agriculture and its products don't seem like such a good deal! To be fair, our modern penchant for eating processed foods instead of cooking meals from scratch is a personal choice. But even if you prefer a microwave to a wok, eating "natural" versions of processed foods will help you begin to avoid some of the contaminants listed above, and going to organic versions will be a quantum leap up from that. 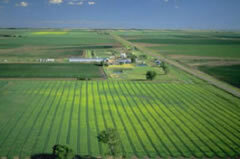 Organic farms also tend to be small and farmer-centric, not corporate-centric. Beyond improving our personal eating habits, how can we untangle the bale of brambles that is corporate farming? The next Eco-Logical—the final segment of this series—takes a look at challenges and solutions. Song: "Rain on the Scarecrow"